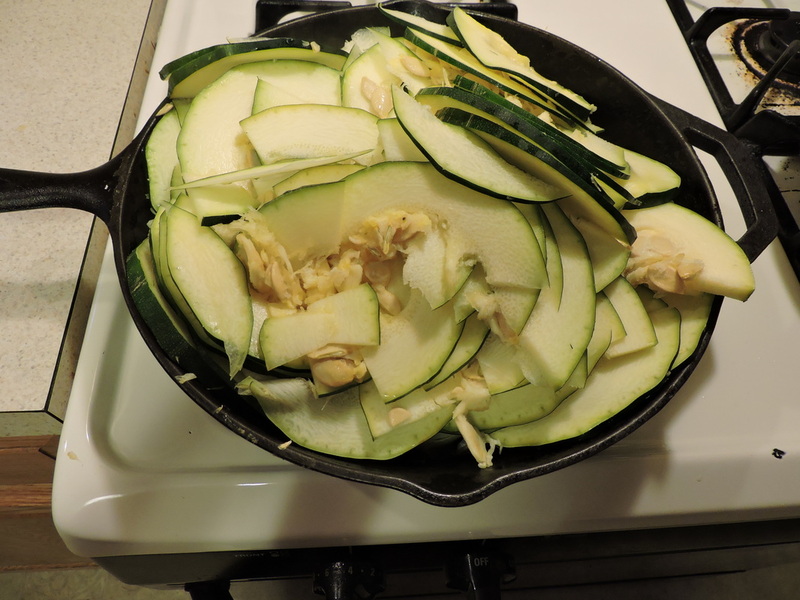 Preserving food is so vital to being self-sufficient! No matter what size garden you plant, you will always have extra food. It is great to give some to neighbors as well. When it is time to harvest, when all the fruit is ripe at the same time, you must decide the methods to save food for the colder months. By freezing the produce, you lock in many of the vitamins and minerals naturally found in the vegetables. I find that freezing is the best method to assure my vegetables will be full of vitamins and minerals for future months. All you need to freeze your vegetables are freezing containers or freezer bags, a freezer and your fruit. Freezer bags are great if you have a small freezer for storage. It is very important to harvest your vegetables at their peak when freezing them. Only freeze vegetables that are ripe, have no bad spots and have no fungus or rot growing on them. The produce needs to be in excellent condition for it to be enjoyable when eaten after frozen. Avoid using produce that is over ripe as it tends to be bitterer and the texture is tougher than the tender, perfectly ripe produce. 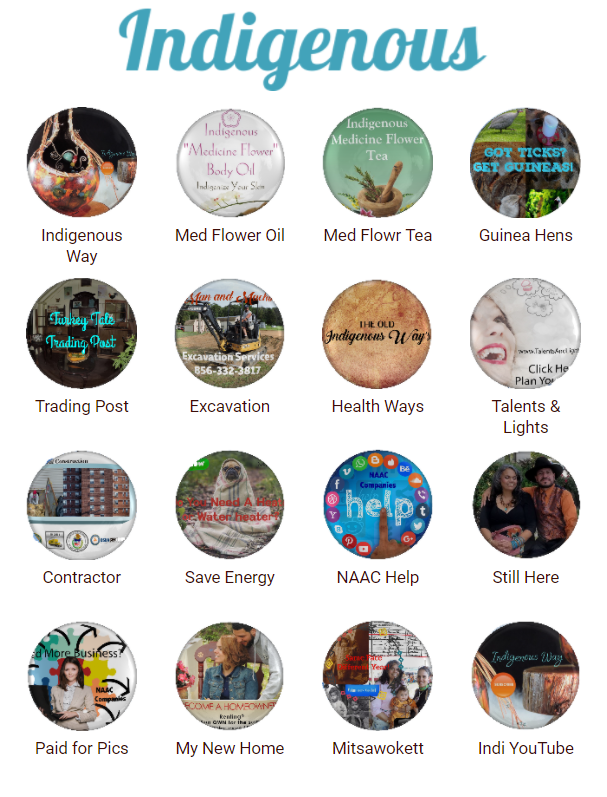 The following pictures will give you an idea with the simple steps to enjoy the fruits of your labor! Pick the items at peak ripeness. Here I have zucchini and yellow squash that I will process for freezing. Wash the vegetables thoroughly! Spend a few minutes on each one, making sure that there are no blemishes or bad spots. Prepare your process. 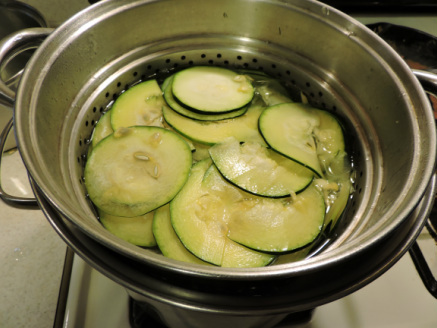 You will need a large pot to boil the vegetables and if you have a boiling basket, the process is easier. You will also need another pot for ice and water to cool it off fast. Start boiling! Slice the squash no more than 1/4 inch thick. I prefer a bit smaller. It is best to slice a good amount to get ahead of the blanching (boiling) process. I will use 1 gallon freezer bags for my process. This will make one meal with a little leftovers for lunch the next day. One gallon fits right to the top of my boiling basket. I also have my ice water ready! When the water is rapidly boiling, place the basket inside and boil for 3 - 5 minutes. I boil for 4 minutes for the thickness I prefer. After it has cooled, about 3 minutes, dump it into your strainer and drain off all the water, about 5 minutes. Place it in your freezer bags, squeeze out all of the air, seal and freeze! You can determine the size bags that best fit your family. 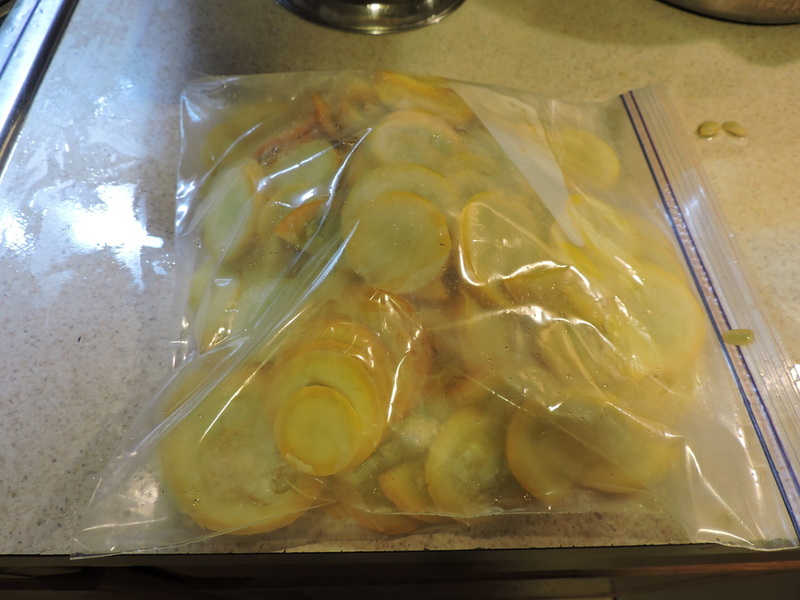 With the squash pictured in the beginning, I was able to freeze 7 bags with one gallon extra that we ate for dinner tonight! I hope this process helps with your food preservation.